This Case History covers an aqueous parts washing system to thoroughly remove cosmoline from various compressor components. Two MKD24 Consoles are used for the system – wash/rinse and rinse/dry. Each processing chamber incorporates a transport elevator to position and oscillate the part(s) within the working zone. The line runs left to right. The all stainless system accepts up to a 20″ long x 20″ wide baskets with a gross weight of 150 pounds. 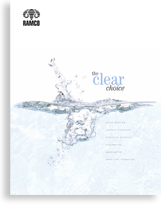 RAMCO Equipment two MKD24 Consoles – wash/rinse and rinse/dry. At the heart of each stage is a patented NFPA Floating Cylinder used to transport and oscillate each process elevator. The process elevator(s) are the basic building blocks for each step in the process. 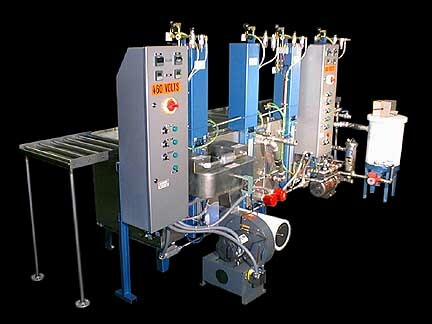 They are used to produce changing flow patterns when combined within other dynamic processing modes (in this case turbo /agitation washing, dual agitation/cascading rinsing and hot-air-knife drying). The parts are dried in a very effective hot air knife/blow-off drying stage. All stages include digital cycle timers and temperature controllers. 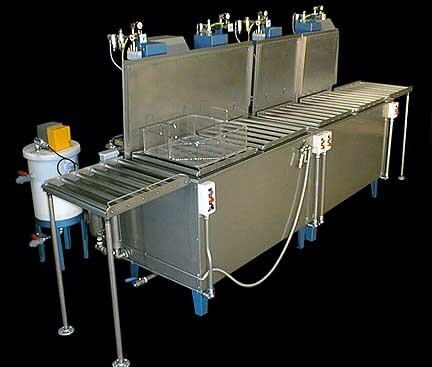 Platform roller conveyors are included (see above) to facilitate transfer between stages. The system is built in accordance with Nema 12 electrical and NEC codes including the control panels, switches, pilot lights and lockout-tagout disconnect switches. RAMCO Equipment Multi Station Consoles feature accessibility. The layout (see above) is unique; unlike conventional console systems, RAMCO Multi Station Consoles are built for the rigors of production. Nothing is placed underneath processing tanks or tucked behind “access” panels. Piping, control valves, pumps, filter housings, pneumatic cylinders, heating elements, immersibles, generators, etc. are all located outside the console, clearly visible for inspection and accessable. Maintenance and service are easily accomplished.